The kitchen in a restaurant can be a chaotic space. From customizing orders and cleaning dishes to chopping ingredients and cooking dishes, there’s a lot for a chef and other cooks to handle. That’s why you need to create a good management system, a strong team, and a well-planned space to facilitate these tasks. It is important to listen and welcome the complaints and ideas from your team members. Imagine the kitchen restaurant as a human body: your cooks are your ears and eyes which can spot and find out areas for improvements that you might miss. Since the turnover rate in the restaurant industry is extremely high, caring for your staff is the most effective way to keep them enthusiastic and engaged. Another important thing to run your kitchen successfully is to streamline and organize all the processes. It should function in a way which allows cooks to prepare and serve all dishes on your menu without delay or hassle. It is advisable to dropping any dishes which take too long to prepare and cook, or keep them as special dishes which can be served in non-peak hours. 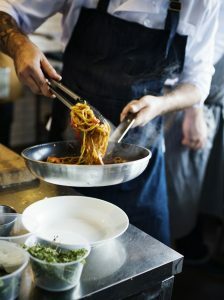 Pasta Rea advises to make your restaurant menu simple to manage and train your cooks to function accordingly. This will save you a lot of time and effort while improving your customer’s satisfaction. Modern technology might vastly improve the accuracy and speed of every process in a restaurant. For example, you can use a point-of-sale system (PoS) in daily operation to create a platform where your waiters or waitresses can keep in communication with other employees in the kitchen. By passing messages, cancellations, and orders, it will speed up the whole process and improve your service. However, if the messages are important, it is still better for the waiters to walk into the kitchen and talk directly with the chef. Having a set of systems and practices is great, but it can also suppress the creativity of your chefs and cooks. So what should you do to keep a balance? Firstly, determine which practices are necessary for your kitchen to minimize the mistakes. Think about where and how kitchen staff and servers should move during the busy hours to avoid bumping and causing accidents. After these situations or practices are well planned, highlight what you might expect from each employee and give them suggestions. Once you’ve created this balance, it is likely that your team will work more effectively, safely, and quickly at all times. As a result, you can reduce the wait times and improve the quality of food and service to keep your customers satisfied. Overall, it requires a lot of hard work when it comes to knowing how to run a restaurant kitchen successfully. With a little bit of planning and caring, you can improve the efficiency and speed up the whole process to provide your customers with more delicious dishes.